Natural looking crowns in just one visit! When was the last time you went to the dentist for a new crown? If you went through the fitting process only to come away with a temporary crown, you know how time-consuming it can be to get your permanent crown. But what if you could get it all taken care of in only one visit? Now you can. Come to the dental office with the best technology in Charlotte, NC, Dr. Heather D. Rorison Cosmetic & Family Dentistry! We have crafted a modern, comfortable environment for your dental visit. Now it’s easier than ever to relax and take advantage of our Sirona CEREC® technology, all in one appointment. After our trained staff at Heather Rorison Dentistry has examined your tooth and worked with you to determine the best course of treatment, your CEREC visit will be scheduled for a time that’s convenient for you. At your appointment, our team will prepare your tooth restoration, saving as much healthy tooth structure as we can. We will take a picture of the tooth to be repaired using a special digital camera, then the CEREC imaging software will create a 3D model of your restoration on our computer screen. Once we have the 3D dental model of your restoration, all the CEREC software needs to get an accurate image of your tooth is a thin layer of reflective powder! Rinse it off, then sit back and watch us make your custom restoration right before your eyes. CEREC restorations are made of a biocompatible ceramic material that can be adjusted to match the natural color of your other healthy teeth. We insert a block of the ceramic material into our onsite CEREC milling unit, which then constructs your tooth restoration according to the exact specifications outlined by the virtual model. After only 20 minutes or so, your restoration is ready to be placed. Because the computer-aided manufacturing is extremely precise, you’re sure to have a great fit when your newly milled crown is polished and bonded to your tooth. because today’s ceramics are even more durable and beautiful than thematerials of the past. Because the fit is better than ever, you will also find your teeth easier to keep clean and free from decay. 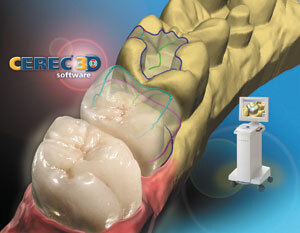 Contact our offices today for more information on CEREC®or to make an appointment. A great new look is only a phone call away!